Back when the only way to watch Arrested Development on Netflix was to get DVDs of the first three seasons in the mail, talk of a Bluth family reunion usually circled back to a movie. Ron Howard teased the concept at the end of “Development Arrested”; from the time the show left the air until the moment season four was a done deal on streaming, any cast member promoting a new project could expect to address the topic in interviews. (Many of which you can still read on this very site.) Even after Netflix announced the revival, the idea of a movie wrap-up persisted: In a 2012 Random Roles interview, Jessica Walter said “We’re supposed to do a little series thing this summer for Netflix, and from that would come the movie.” In those terms, any TV continuation sounds like an appetizer—the movie’s the main course. 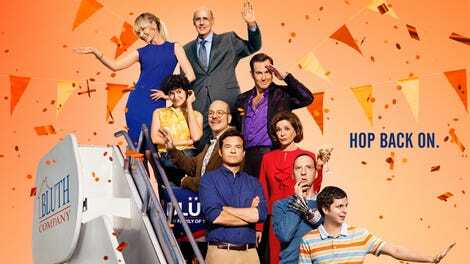 The way the meal panned out, however, scheduling conflicts and the new frontiers of streaming TV turned that “little series thing” into something of much greater ambitions, and the Arrested Development movie was put on the backburner once more. But with “Sinking Feelings,” the fifth episode of the show’s fifth season, I think we get a clearer picture of what the Bluths’ cinematic exploits might’ve looked like. In all likelihood, we’ll never get to see an Arrested Development movie, but “Sinking Feeling” gives me the sinking feeling that such a movie would be as awkward as a man with a metal strap around his artificial hand, and rubber bands around his real one. It comes into focus in the lead-up to The Golden Anchor Family Of The Year Award, a bogus accolade that people who can’t act like they love each other for a minute (let alone a year) are giving to themselves, at the site of the first successful business venture they ever stole—which, judging by the police tape and the banana-stand residue on the boardwalk, was recently successfully stolen, then deposited, into nearby Newport Bay. This is not the type of thing you lead an episode with; neither is that encounter between George Michael and Michael outside Rebel’s apartment building. That’s the type of thing Arrested Development previously ended an episode on, with shocking violence that isn’t repeated this time until Michael elaborates on the lesson he wanted to teach his family. And it’s at that point he’s punched in the face by his mother, in a scene that, again, isn’t the end of the episode. There’s still a jailhouse visit, Barry Zuckerkorn encore, and model-home blow-out to go before that happens. Only one of those scenes is the ending of “Sinking Feelings,” but all of them are part of an ending for Arrested Development. “Sinking Feelings” isn’t so much an episode of the show as it is the culmination of a feature-length Arrested Development story told over the first five parts of season five. Michael’s plot and his scuba expedition fall apart, while Lindsay ditches the campaign trail (with the help of a well-placed sheet), George-Michael and Maeby get that kiss, Tobias’ acting gets recognized, GOB’s speech drives George Sr. to jump into the ocean, and every last one of them ruins Lucille’s big moment. Nobody gets a trophy, but they all go to jail—as visitors, with the exception of Tobias (mistaken for Buster), Buster, and Barry. It’s all the type of thing that used to be wrapped up in the last five minutes of an Arrested Development: All of the backbiting, misunderstandings, and naïve blundering twisting into a farcical knot like the Living Classics Pageant from “In God We Trust.” “Sinking Feeling” just makes that wrap-up act the whole episode. And in doing so, it makes watching season five feel like looking at one of those paintings from the pageant from close up, then slowly backing away to see the speckles of paint come together into a coherent whole. It’s an interesting way of telling a story on TV, and one that acknowledges the people who’ll be watching season five more than one episode at a time. But I don’t know if it’s any good. Look at it this way: What really impressed me about season four wasn’t that it set out to make an eight-hour movie or something, but that it used the extra run time and lack of definition afforded by Netflix to tell a story that, the more of it you watched, the more it grew and transformed and fed off of itself, and the more angles you got to consider it from. It was like a living sculpture, imperfect and never quite complete, but usually compelling—and truly unique. “Sinking Feelings” is part of something that feels more traditional and more linear, the final act in a half-hour script whose beats have been spaced out to run two-and-a-half hours, with some hit-and-miss material filling the spaces in between. What a strange frankenepisode this is, an ending and a beginning held together by some decent jokes (I was happy not to wait for the payoff to that Gilbert Gottfried voiceover that’s blaring in the background of “An Old Start”); a rekindling of the multi-generational cycle of disappointment and reconciliation that connects George Sr., Michael, and George Michael; and the beginning, in earnest, of the case against Buster Bluth. As much joy as there is in watching Buster do some hurkey-jerky dancing to the beat of Fakeblock, “Sinking Feeling” does make a lot of what came before it feel like it was just whetting our appetite for the Making A Murderer riff that was teased back when a fifth season of Arrested Development was still a theoretical. 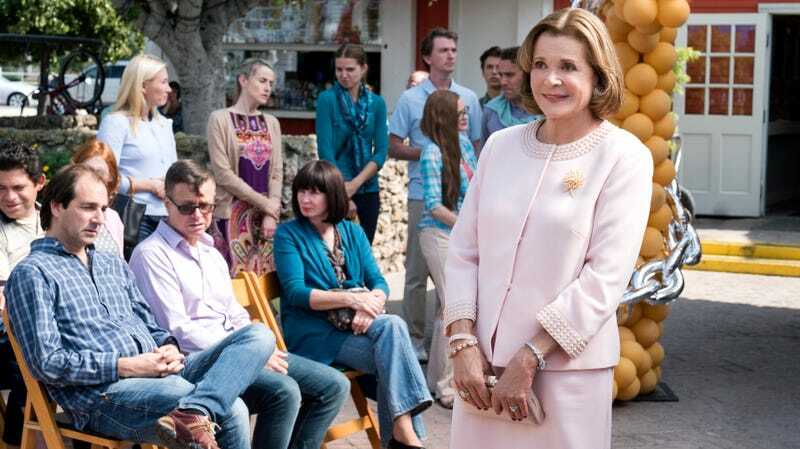 How much of season 4 does Arrested Development want us to forget?